Sephora is an innovative skincare, beauty, and fragrance retailer catering to customers who want quality, freedom, and a positive shopping experience. The following is a paper by Justin Tung about Sephora as part of coursework from the “Creating Consumer-Oriented Merchandising Programs” course at University of Toronto. pictures). The segment of women attracted to Sephora would be those who value fashionable/quality skincare, beauty, and fragrance products and are open to a medium to high price range. Also, there are product sections with richly decorated cosmetics that would appeal to young girls (pre-teen to teenager). The black and white colours of the store give a look attractive to professionals. The wide assortment of brands, vendor exclusives, and private label combinations would attract any shoppers looking for variety (Sephora USA Inc., 2011). The freedom a Sephora store provides allows customers to navigate the store as they please, try products on their own time using demos, and ask for service if needed. The nature of beauty products means women must try them to see their effects and compare. The freedom to try products without high pressure sales and sales associates recommending certain brands typical of service oriented department stores helps consumers take the time to enjoy the shopping experience and choose what fits them. Despite the strengths of Sephora’s store layout and retail mix, Sephora had to close their stores in Germany and Japan in 2001 and 2002 due to economic conditions and poor performance (DFNI Online, 2001). Sephora’s parent company Moët Hennessy Louis Vuitton (LVMH) may have expanded Sephora stores too aggressively in 1999 following excellent profits/sales, causing problems in the early 2000s, when new markets did not perform as expected (Retail Traffic Magazine, 2002). In Japan, Sephora’s traditional strength of a self-service environment became a weakness since it did not fit with the expected retail experience of Japanese consumers and procurement of supplier services. The result was domestic suppliers only gave Sephora a limited supply and consumers were confused with store layouts and low service environment (Carter Associates, 2008). How can a Beauty Retailer Successfully Transition to an Online Channel? The retailer should set a strategic goal their online presence will achieve. Some example goals are to provide a self-service sale channel or encourage sales conversions through content. By establishing a website, a beauty retailer should concentrate on format development of the online channel (e.g. online deals, promotions, advice) resulting in benefits of market penetration and market expansion into new geographic segments on the internet. The content of the online channel should engage consumers in learning about, selecting, and using beauty productions through media such as pictures of products and video demonstrations. The retailer can consider online advertising (e.g. search engine marketing) and social media to establish its brand online. Targeted online advertising will aid in market expansion to reach a larger audience, especially for an international retailer. Finally, the retailer should consider business aspects like supply chain management and evaluate suppliers/shipping and opportunities for cost reductions. Initially, human and information communications technology resources should be kept inside the company to maintain brand consistency and pricing across all channels and keep e-business knowledge in the company (Chaffey, 2009, pp. 261-311). advice) such as usage tips and recommendations. The videos are professionally produced and the reviews and expert advice provide relevant content to users in making decisions (Sephora USA Inc., 2011). Sephora.com also employs a variety of best practices in e-commerce websites such as “popular picks”, tiered navigation interface, suggestions, rich visual content, and explanations of products from the consumer’s perspective (i.e. how to use product, why use it). Having these features on the website provides value to consumers through access to information and aids in conversions (Chaffey, 2009, pp. 413, 419, 437). Pictures are of the Sephora store located on level 3 in the Toronto Eaton Centre taken by Justin Tung on October 29, 2011. Pictures show the store layout, design (colours, product sections), and target market/personas of Sephora. Chaffey, D. (2009). E-Business and E-Commerce Management, Strategy, Implementation, and Practice. Edinburgh Gate: Pearson Education Limited. 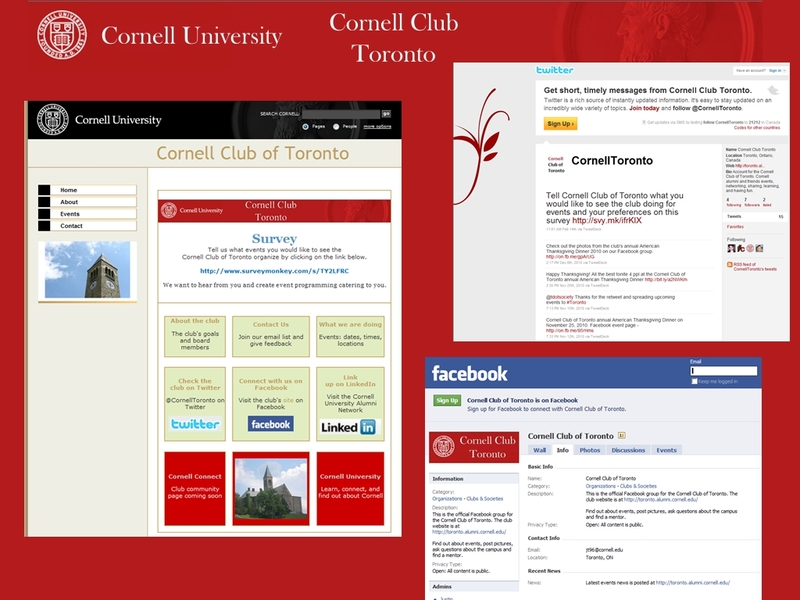 News/events information, feedback form, and content about Cornell Club of Toronto posted on website and social media Facebook and Twitter channels. Email marketing through newsletters and social media community management linked to websites. 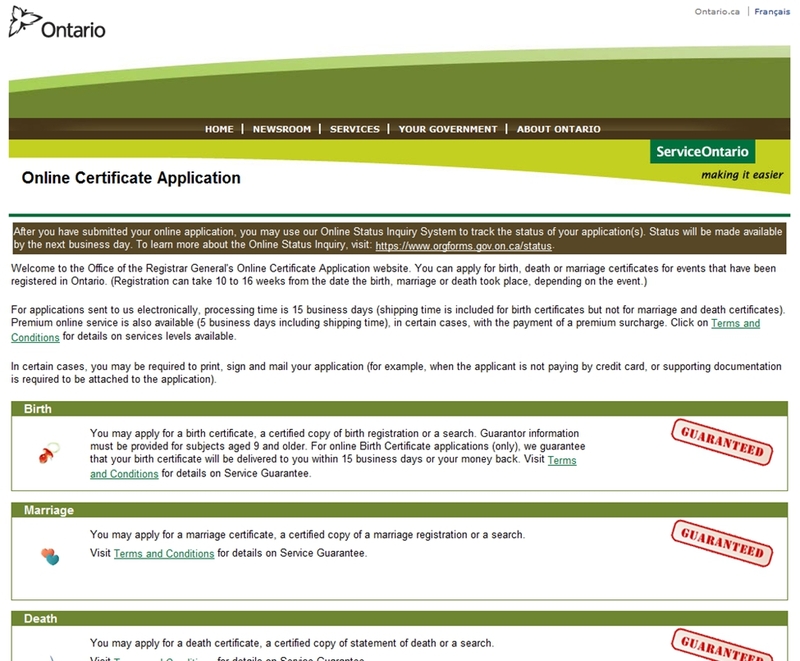 Ontario Online Certificate Application with 3000-7000 electronic transactions per month supporting English and French with bilingual decision logic, complex validation, feedback mechanism, and payment. First service to have a government money-back service guarantee in North America. *During time of initial launch. Current version has enhanced features and functionality.